There are many activities your family might be looking forward to with the coming of summer, such as picnics, backyard barbeques, and hiking at a nearby nature trail. However, unwelcome pests can make these outings difficult. While some bugs are beneficial, others can be dangerous and deliver a painful bite or sting, and others are capable of transmitting disease to humans. No matter where you roam this summer, knowing how to spot and avoid these insects can help you and your family stay safe all season long. While these two species of flying insects are similar, there are a few differences in their behavior that may help you identify them. 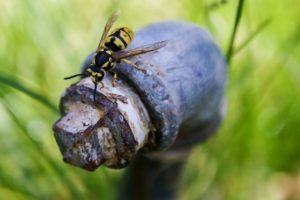 Wasps, which include yellowjackets and paper wasps, are typically varied in color and build large community nests. Yellowjackets are more likely to build their nests in the ground, so it is important to be aware of them if you are hiking in an unfamiliar area. Hornets build nests much like wasps do, but they tend to be much more aggressive if they are accidentally disturbed. These insects are usually dark brown and are generally larger than wasps. If you encounter a nest, leave the area quietly and do not try to swat at any of the colony, as this may provoke it to attack. While you might think of ticks as a problem that mostly affects pets, ticks will attach to and feed on humans as well, and research suggests that the presence of these pests is spreading. Ticks can be found in tall grass, burrowed in dirt, and even in your backyard garden. Some ticks can transmit Lyme disease, which causes reoccurring rashes, muscle stiffness and fatigue, so it is important to avoid their bite. Wear bug repellent while hiking or walking in tall grass and avoid wearing sandals in these areas. There are many species of ants in the United States, most of which live in underground nests. While most are harmless, they have become well adapted to living among humans and will invade your home if given an entrance and an available food source. Some species, such as the fire ant, are capable of delivering a painful bite if their mound is disturbed. Since ants are so adaptable, it can be difficult to avoid them. However, there are a few tactics you can use to keep pest away this summer. Keeping your floors and counters free of crumbs and sticky spots can discourage them from foraging indoors and trimming your trees and bushes may make it more difficult for them to find a way into your home. While scorpions are not true insects and are more closely related to spiders, smaller species resemble insects. These solitary creatures are native to desert areas of the American Southwest but sometimes come into contact with humans. Their sting can be quite painful and cause an allergic reaction in some people, so knowing how to identify them can help keep you safe. Desert scorpions are typically no more than four inches long and are tan or light brown in color. Their arched, segmented tail is simple to spot. They are nocturnal and can be found hiding under rocks, leaf litter, or inside loose tree bark during the day, but you may see them while camping or during an evening bonfire. However, it is unwise to try and handle these arachnids, as they may sting in retaliation. Enjoying barbeques, hikes with the family, and camping trips can make for a memorable summer. However, venturing into the great outdoors means you may encounter potentially dangerous pests, and knowing how to identify and avoid them can help keep you and your family safe, no matter how you choose to spend those long, lazy summer days. ← How Many Solar Panels Do I Need?